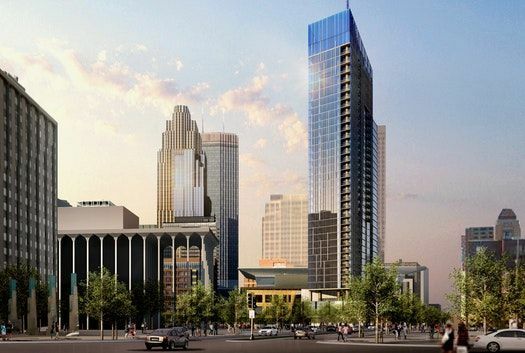 The city of Minneapolis has fully executed its redevelopment contract with United Properties to build its 33-story tower on the northern end of Nicollet Mall in downtown Minneapolis. Construction of the stymied skyscraper to be built on the Nicollet Hotel block has been delayed as developer United Properties, which was awarded exclusive negotiating rights for the property in April of 2015, requested extensions multiple times to finalize plans and secure financing for the $330 million project. City staff were finally able to execute the agreement Friday after RBC Wealth Management agreed to be the office anchor of the project, which is planned to also include a 275-room Four Seasons Hotel and 18 condos. United Properties, which didn’t respond to a request for comment Friday, has now begun the due diligence process of the project and is scheduled to submit land use applications in August. United Properties is scheduled to close on the purchase of the city-owned property by the end of the year, but the closing could be extended until June of 2019.